Figure 1. 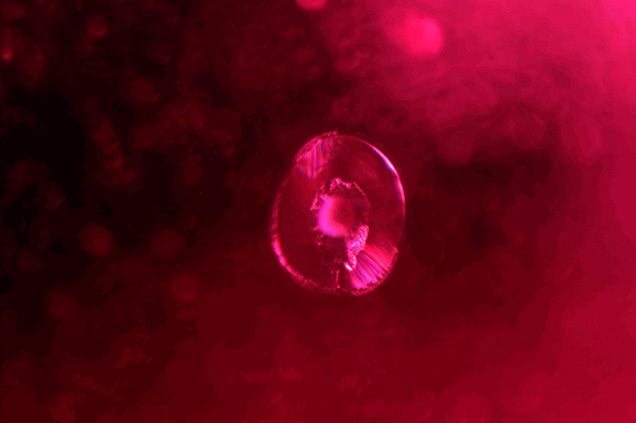 A thin layer of synthetic ruby overgrowth with flux particles is distinct from the natural sapphire seed visible in the upper right of the image. Photo by Hollie McBride; field of view 1.99 mm. The New York laboratory recently received two loose red oval mixed cuts for identification. Standard gemological testing yielded refractive indices slightly higher than expected for corundum: 1.778–1.788 and 1.776–1.787, while a typical RI for corundum is 1.762–1.770. Elevated RIs for chromium-diffused corundum have been reported and may be attributed to higher Cr2O3 concentration at the surface (S.F. McClure et al., “Update on diffusion-treated corundum: Red and other colors,” Spring 1993 G&G, pp. 16–28). To the unaided eye, the stones appeared to be chromium diffused, displaying red color concentration at the facet junctions, but their synthetic component became apparent upon further observation. Microscopic examination revealed that planes of minute particles demarcated a thin layer, approximately 0.3 mm thick, of synthetic overgrowth from a natural sapphire core (figure 1). The presence of intact silk and heat-altered crystal inclusions confirmed the seeds to be natural (figure 2). A series of shallow flux-fingerprints cracking the surface suggested a flux growth process (figure 3). Portions of the near-colorless core could be seen in areas where the overgrowth was cut away during polishing (figure 4). These windows showed a sharp boundary without “bleeding” of the saturated red overgrowth into the near-colorless seed, which is typically observed in chromium-diffused corundum (McClure et al., 1993). The windows into the near-colorless seed also indicate that most or all of the red color is concentrated in the synthetic ruby overgrowth. Figure 2. A fuzzy heat-altered crystal inclusion commonly referred to as a “snowball” is surrounded by a discoid fracture, proving the natural origin of the corundum seed. Photo by Hollie McBride; field of view 1.26 mm. Figure 3. 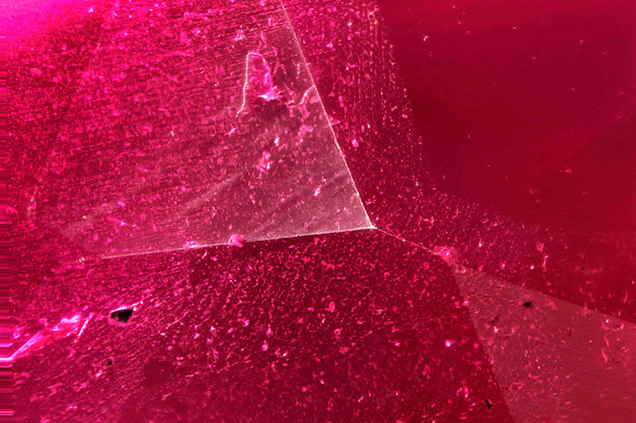 Reflective silk inclusions in the natural sapphire seed are visible behind a coarse flux fingerprint in the synthetic ruby overgrowth, which was cut through during the fashioning process. Photo by Hollie McBride; field of view 3.57 mm. Figure 4. A portion of the near-colorless corundum seed is revealed in an area where the synthetic ruby overgrowth was cut away during fashioning. Photo by Hollie McBride; field of view 10.85 mm. The overall appearance of the two stones was similar to the now-rare Lechleitner synthetic overgrowth emeralds, which are composed of a near-colorless beryl seed with synthetic emerald overgrowth. 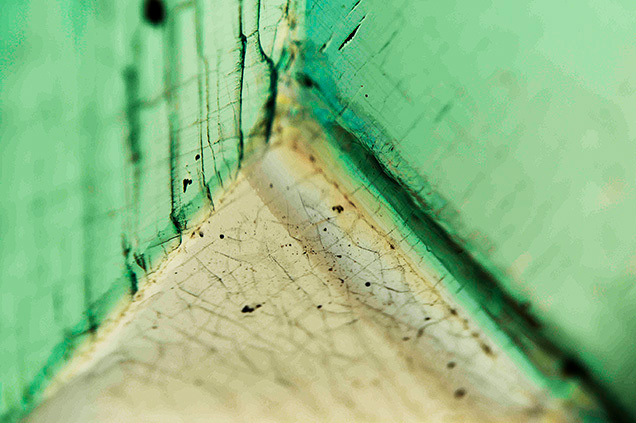 A sample with this type of synthetic emerald overgrowth was coincidentally submitted to the Carlsbad laboratory for identification around the same time (figure 5). In addition to emeralds, Lechleitner also experimented with ruby overgrowth on both synthetic and natural corundum seeds (K. Schmetzer and H. Bank, “Lechleitner synthetic rubies with natural seed and synthetic overgrowth,” Journal of Gemmology, 1988, Vol. 21, No. 2, p. 95–101), with the most commonly documented versions containing synthetic seeds (E.J. Gübelin and J.I. Koivula, Photoatlas of Inclusions in Gemstones, Vol. 2, Opinio Verlag, Basel, Switzerland, 2005, p. 352; Fall 2014 Lab Notes, pp. 242–243). Figure 5. A thin layer of synthetic emerald deposited on a near-colorless beryl seed, a type of synthetic emerald first marketed by Johann Lechleitner in the early 1960s. Photo by Hollie McBride; field of view 3.57 mm. Advanced testing on the synthetic ruby overgrowth layer using laser ablation–inductively coupled plasma–mass spectrometry (LA-ICP-MS) revealed the presence of Cr, Fe, Ga, Mn, Mg, Ni, Ti, Pt, and Zr (table 1). These results, specifically the presence of platinum, are consistent with previously reported synthetic ruby overgrowth (S. Saeseaw et al., “Analysis of synthetic ruby overgrowth on corundum,” GIA News from Research, June 10, 2015). Molybdenum was reported in the primary examination of Lechleitner overgrowth rubies (Schmetzer and Bank, 1988), and its absence here suggests alternative growth conditions for these samples. Although this is not the first report of synthetic ruby overgrowth on natural sapphire seeds (Schmetzer and Bank, 1988; C.P. 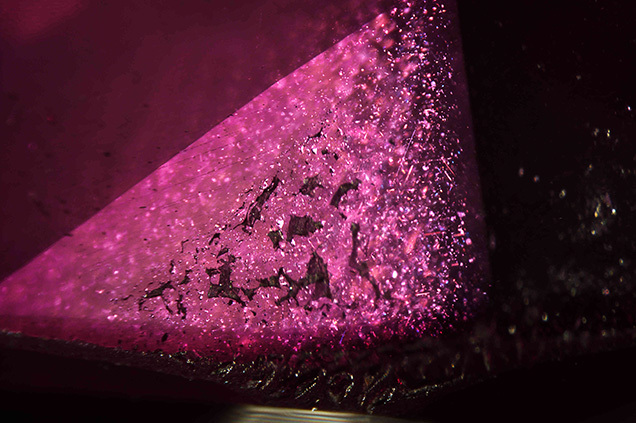 Smith, “Diffusion ruby proves to be synthetic ruby overgrowth on natural corundum,” Fall 2002 G&G, pp. 240–248), it marks the first time the New York and Carlsbad laboratories have had them submitted for identification. The resurfacing of these vintage overgrowth synthetics shows that once a material is in the trade, it is here to stay. Tyler Smith is a staff gemologist at GIA in New York. Hollie McBride is a staff gemologist at GIA in Carlsbad, California. Explore sapphire history, research, quality factors, and more in the GIA Gem Encyclopedia. 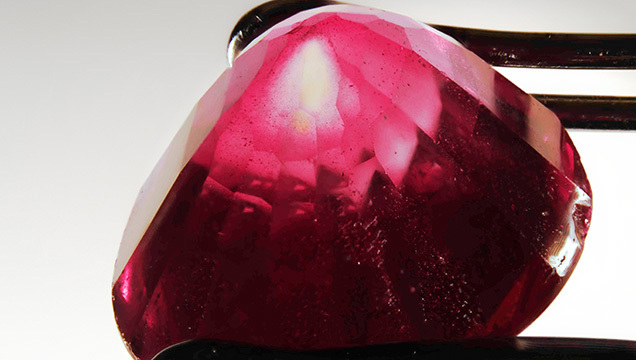 This synthetic ruby specimen features two growth methods within the same crystal. A relatively new production of red corundum, reportedly from Bangkok, has been offered for sale in recent years. Blue diffusion-treated sapphires have become a subject of considerable controversy since their introduction in significant quantities a few years ago.